13-Aug-2002 -- Planning our motorbike-trip to and through Slovenia contained of course looking if it's there or around an unvisited confluence point. Slovenia's points are all visited, but near the border in Croatia this point was still "free". So we kept it in mind for the case we pass near by. At this day we planned to reach the point on small roads as we travelled through Slovenia, too. Getting to the area was a snap. 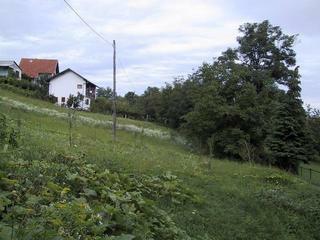 The next village from the point is called Donja Stubica. Here the land is hilly, rural but even so densely populated. Our first attempt from the west was less then 700 m, the second attempt from south west was near the house of a farmer around 500 m. The man really wanted to help us but we couldn't explain him our goal because of the lack of a common language. The next road was the first getting straight to the point but stopped also at a farmers house. On the way back we passed a restaurant where we asked for somebody speaking English or German. So we met Oliver Miseric who joined our team and who knows everthing and everyone here. He explained us that from the east side two local roads could be possible. So he drove in front and we followed him and reported distance and direction. The first road he showed us was getting from west to far north so we turned. The second road was getting from southeast straight to the point, so we got in of the 100 m circle straight on the road. I honked to Oliver to stop and we had to go by foot further on. Luckily the point is just beside the road in the garden of a friend of Oliver (as i described, he seems to know everyone). This friend was away for holiday but with the permission of Oliver we made photos in the garden. For other foreigner wanting to visit here, here is the best description I remember: Coming from west (Stubičke Toplice) you have to follow the left road where the road forms a Y in Donja Stubica. This road would follow to Lepa Ves, but just on the other side of the railroad crossing you have to turn once more left. From here the road is more or less straight heading to the confluence. Have fun! Thanks again to Oliver who helped us and greetings to the landowner of the confluence. I hope you would report here as another visit.